Gentle, inquisitive, friendly and as cute as a muppet. 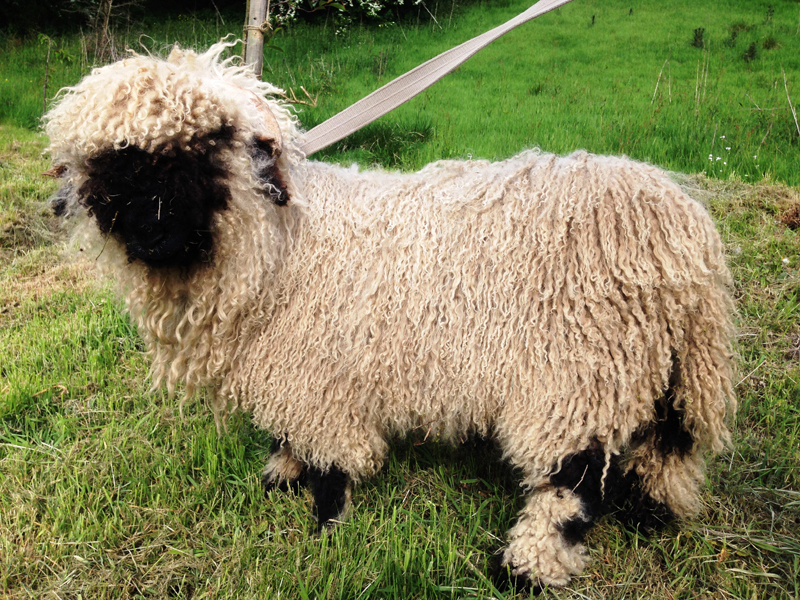 In 2014 we were one the first to own Valais Blacknose sheep in the UK. 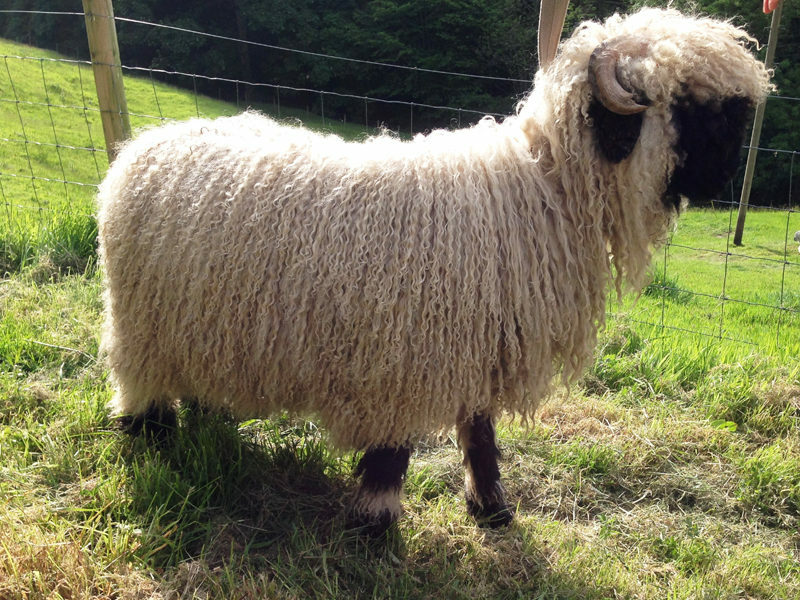 If you would like to learn more about our Valais Blacknose Sheep for sale UK, please follow this link. The Valais Blacknose is a heritage breed from the Upper Valais region of the German-speaking part of Switzerland. This domestic sheep breed is also known as Blacknosed Swiss, Visp, Visperschaf, Walliser Schwarznaseschaf and Wallis Blacknose. Although they are quite popular in its native area, they are not very common around the world with their population of 13,700 herdbook animals. It is estimated that the reproduction power of the breed is about 1.6 lambs per year. 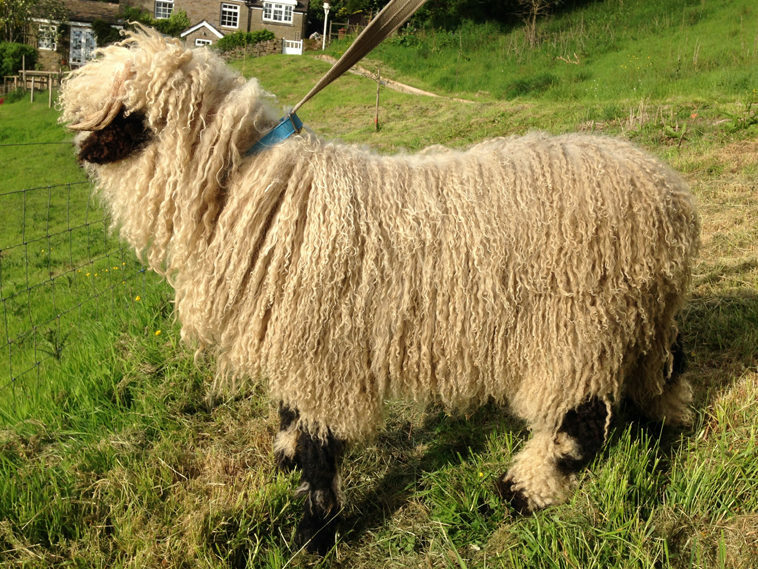 Unlike most breeds of sheep, Valais sheep breed all year round and are not seasonal like the majority of sheep. 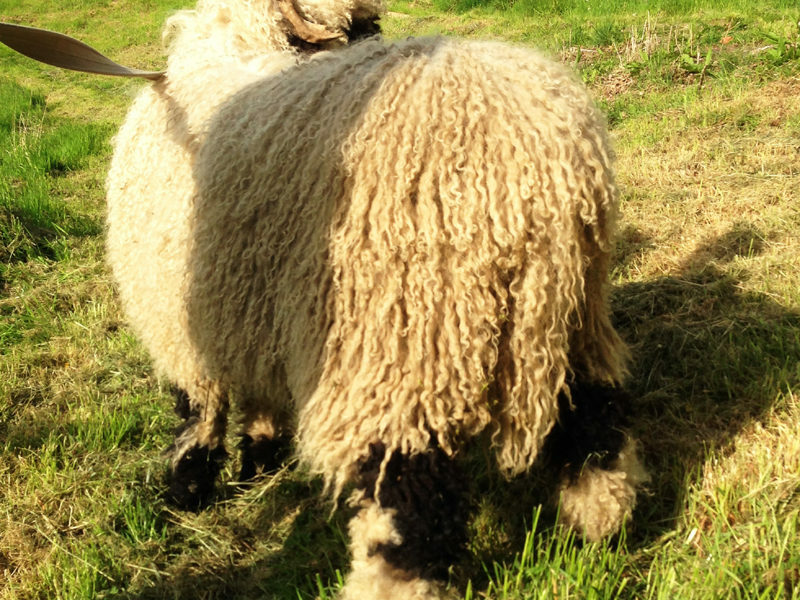 The black-nose sheep are a dual-purpose breed, as they are raised both for meat and for their wool. 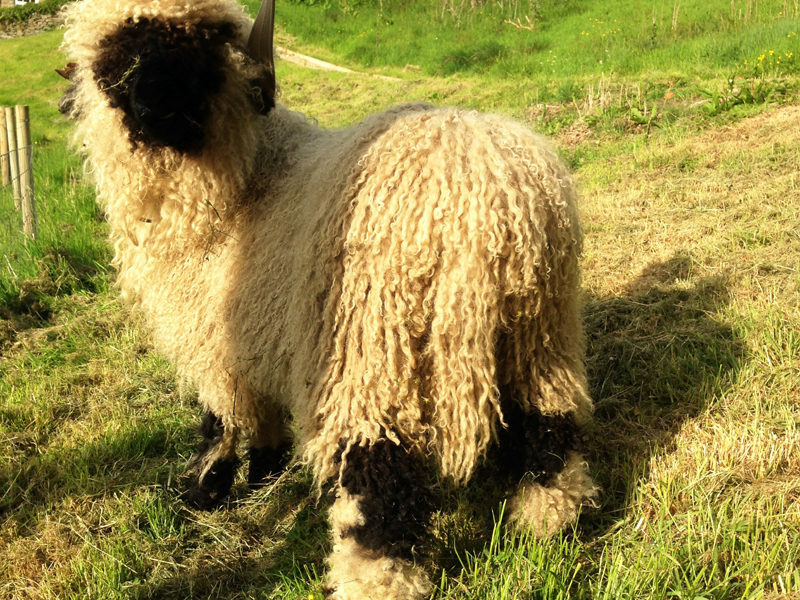 The wool of Valais Blacknose is coarse in nature and is used mainly for carpets and felting as well as for mattress stuffing. The meat obtained from the Valais Blacknose sheep is of excellent quality and is famous for its tender nature. Besides, their skin, horns and fleeces are frequently used by the breeders as decorations or sold as popular holiday souvenirs. In addition, the animals are well-adapted for living in the extreme climatic conditions of the high mountains. They are also known to be simple to care for, highly intelligent and calm. They do not shy away from contact with humans. As a result, many residents of Upper Valais have started keeping them as pets in recent years. They can be tamed in short period of time and their nature is placid which, combined with their striking appearance, make Valais Blacknose the perfect pet sheep. Although nowadays the sheep are bred in the mountains of Switzerland, in Germany and the United Kingdom, they are native only to Switzerland. They have been raised in the Swiss Alps for hundreds of years. The first mention of these animals (presumably by Hans Hinrich Sambraus) dates back to the 15th century, however they became a separate breed not earlier than in 1962. 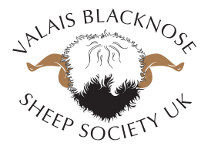 What is interesting The Valais Blacknose Sheep Association (Oberwalliser Schwarznasen Schafzuchtverband) was founded in 1948, that is 14 years before they were officially recognized as a breed. Besides, it is thought that the Valais Blacknose sheep, which belong to the Northern Short Tailed group, are the forefathers of the many coloured breeds that can be found along the trading routes the Norsemen took a thousand years ago. 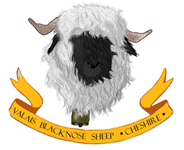 Another interesting fact which may be also surprising, is that the first Valais Blacknose sheep appeared only recently in the UK, namely in February 2014. However, since then they have become the new favourites of livestock keepers in Cheshire and one of the most prized livestock in the UK. The Blacknosed Swiss are often described as large-framed, sturdy sheep with unique wool texture and colour characteristics. They are mainly white, with black marking on their heads — one dapple from the nose to the middle of the head connected to two black circles around their eyes. Their ears are black too. They might also have black spots on their legs, but only females are allowed to have black parts on their tails. It is unacceptable for rams, though. What is the most peculiar for the breed is their long, uniform-white coat. It grows evenly all over the body, even on their heads or legs. The wool cannot be twisted and its colours cannot be mixed. The fleeces vary individually but they grow 12 inches each year on average. Sheep are shaved twice a year producing 5-6 inches of staple length. Thus, one sheep can give up to 4 kilograms of wool a year. These domesticated animals are well suited to live in the extreme climatic conditions of the high mountains. The breed’s mountain origins shaped its well-muscled physique. Their heads and necks are short, placed on a long, straight and broad backs. Other characteristic features are a wide mouth, a Roman nose and a broad forehead, medium-sized ears and that both ewes and rams have spiraling horns. They also have a solid bone structure and strong, well-placed limbs. All of these features make it easier for them to graze on steep, rocky slopes.Their movement is sure-footed and not wavering. They are often said to be a large breed, but not the largest. Ewes are 72-78 cm tall (measured from the bottom to the withers) and rams are 75-83 cm tall, which means that generally they are about 2 feet tall. When it comes to their average weight, it is between 70 and 90 kg for ewes and between 80 and 125 kg for rams. The Valais Blacknose sheep are often fielded at many shows and they take part in various competitions. You are likely to find them at shows like Ellingham Show and Romsey Show. There are many criteria that these sheep have to meet if their owners want to win. One of them is that their horns cannot be entirely black. Only occasional black spots are tolerated. Moreover, it is important that they are well separated and placed horizontally in the direction of their jaws. Their limbs must not be cow-hocked or bow-legged. Dwarfism can also exclude a sheep from participating in a competition. 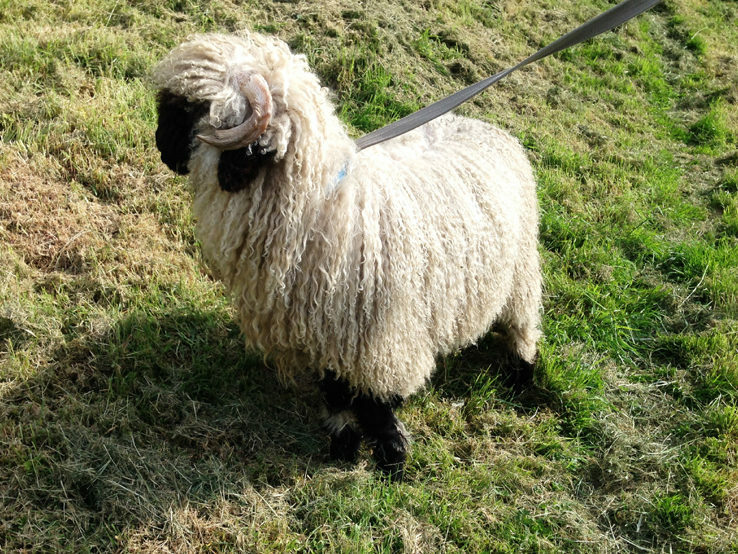 Male sheep must have a distinctive head shape. It is not acceptable for rams to have any black spots above the abdominal line, and as it was mentioned earlier, they cannot have black spots on their tails (which is not a problem in the case of females). Their wool cannot be twisted and its colour cannot be mixed. And of course, all sheep must have their characteristic face and leg pattern. As was previously stated, the Valais Blacknose sheep are cute, fuzzy, robust creatures, which are easy to maintain as they can live in hard climate conditions and on rough terrains. They can constitute a great value for their breeders as well as an exceptional tourist attraction. However, they are currently facing the problem with wolves’ comeback to Switzerland, which is threatening their existence.